P. J. O'Rourke has 1 media appearance. P. J. O'Rourke discusses Eat the Rich. P.J. O’ROURKE autographing and discussing The Baby Boom: HOW IT GOT THAT WAY AND WHY IT WASN’T MY FAULT AND I’LL NEVER DO IT AGAIN. Born at the peak of The Baby Boom, P.J. O’Rourke turns his keen eye on himself and his 75 million accomplices in making America what it is today. With laughter as an analytical tool, he uses his own very average, if sometimes uproarious experiences as a key to his exceptional age cohort. He writes about the way the post-war generation somehow came of age by never quite growing up and created a better society by turning society upside down. P.J. O'Rourke began writing funny things in 1960s "underground" newspapers, became editor-in-chief of "National Lampoon," then spent 20 years reporting for "Rolling Stone" and "The Atlantic Monthly" as the world's only trouble spot humorist, going to wars, riots, rebellions, and other "Holidays in Hell" in more than 40 countries. He now lives in Sharon. P. J. O'Rourke promotes Driving Like Crazy: Thirty Years of Vehicular Hell-Bending Celebrating America the Way It's Supposed to Be—With an Oil Well in Every Backyard, a Cadillac Escalade in Every Carport, and the Chairman of the Federal Reserve Mowing Our Lawn. P. J. O'Rourke's book Backward Ran Sentences was available from LibraryThing Early Reviewers. 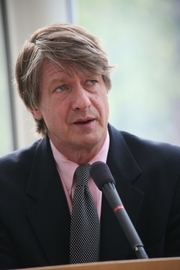 P. J. O'Rourke is currently considered a "single author." If one or more works are by a distinct, homonymous authors, go ahead and split the author. P. J. O'Rourke is composed of 11 names. You can examine and separate out names.